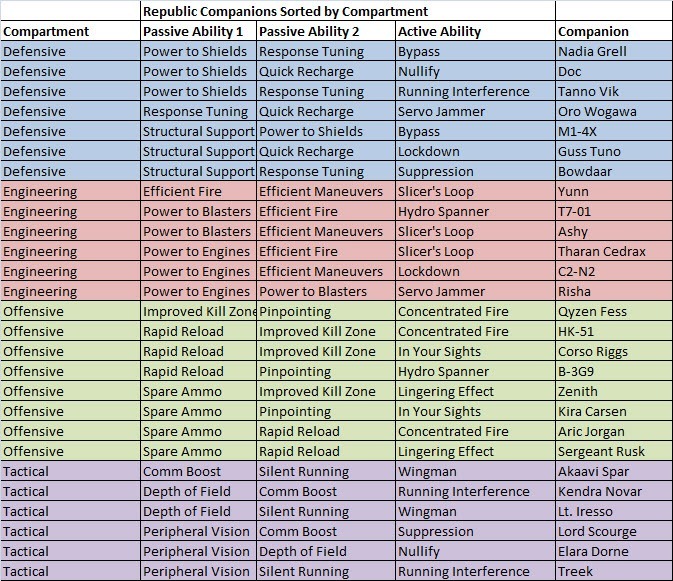 A guide to the companions and crew system within SWTOR Galactic Starfighter. Updated Nov 22, 2013. There are five crew positions aboard your ship in Galactic Starfighter. These crew positions are staffed by companions. If you are wondering, you can indeed pick companions of other classes in the same faction (i.e. a sorcerer can pick Blizz, the bounty hunter companion). This doesn’t make much sense from a lore perspective but keep in mind that Galactic Starfighter is separate from the ground game so anything goes. For the co-pilot position, you select one of the companions you picked for the other four crew positions. This companion would have two jobs, one of them being your co-pilot while the other one would be maintaining whichever other crew position they were assigned to. Each companion carries two passive and one active ability. Their passive abilities are activated when you select them for a specific crew position. Their active ability is only useable if you select that companion for the co-pilot position. 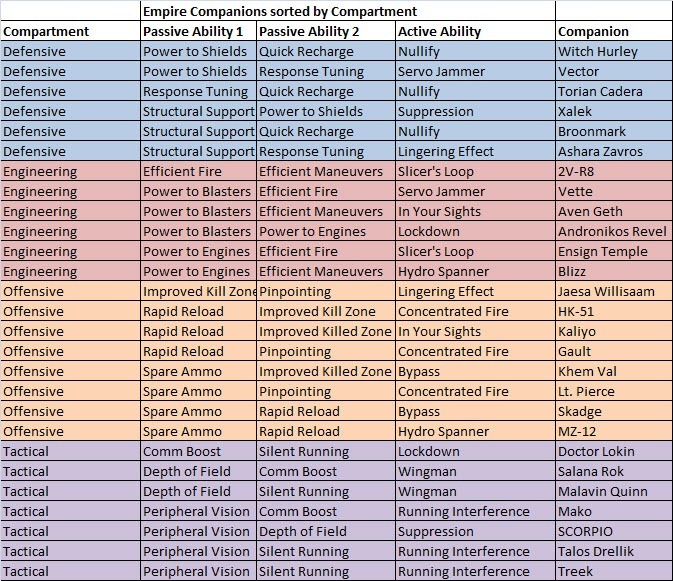 What this all means is that each ship is not only modified by the components you picked but also by the 8 passives bonuses and 1 active ability provided by your select of 4 companions. One additional thing to note is that if you sort all of the companions like I did here, you would notice that the passives are restricted by compartment. You get 4 choices per compartment but you must pick 2 out of the 4 choices. There are eight new companions introduced with Galactic Starfighter. They are specifically for the Galactic Starfighter portion of the game and does not appear in rest of the game. They will fit the five crew spots by default. This allow players without companions (i.e. new characters) to play Galactic Starfighter without being at a disadvantage. The son of prominent officers in the Imperial Army, Aven Geth was always destined for greatness–or so it seemed. Upon reaching adulthood, Aven joined the Navy, where he excelled as a shield technician–that is until his parents, feeling slighted by his choice of military branch, pulled all the right strings to have him summarily discharged. Maintaining an upbeat and unflappable air, Aven deflected his parents’ cruel machinations, patriotically offering his services to any Imperial-aligned starship crew that would have him in spite of his abrupt disgrace. So long as he continues to fight the Empire’s enemies, Aven feels he will yet prove himself to be a loyal and worthy combatant. MZ-12 began its service to the Sith Empire during the Great Galactic War as a simple maintenance droid aboard the personal cruiser of Darth Immern. When the Darth disposed of his crew in a fit of frustration, he had to turn to the MZ unit to help manage the ship’s many systems. Though not designed for such duties, Twelve was able to help guide the ship to an Imperial way station, where Darth Immern had the astromech’s programming upgraded so that it could serve as his personal navigation droid.Since Immern’s death during the First Battle of Bothawui, Twelve has been in search of a new home. It is now quite adept with ship comms and sensors, and is known to have a bit of an ego about it. It doesn’t much bother Salana Rok when people call the Chiss woman an alien, as that’s what she’s felt like all her life–even among her own kind, even among family. The closest Salana’s ever felt to belonging was as hired muscle for a crime syndicate on Hutta. She eventually grew bored with breaking bones on that seedy planet, however, so she has since opted to turn her love of aggression into a career as a starship gunner. While often dour and restless, Salana is known to display an enthralling intensity and gleeful passion for causing her enemies to suffer. She doesn’t quite understand what she needs to finally feel at home, but she hopes she’ll find it someday out among the stars. There is nothing Writch Hurley loves more than technology, and he’s not averse to letting it be known. In fact, he can be frequently caught carrying on about hyperdrive motivator cores and microfusion condenser arrays when no one’s even around to listen. Writch’s random babbling gives him the air of a scatterbrain, but his relentless chatter only helps clear his mind, allowing him to focus on whatever objective is laid before him. Writch’s eccentric and irreverent persona might cause those of a more serious bent to bristle, but there’s no denying that he’s a major talent worth putting up with. He hopes his hard work will one day bring him to the attention of his not-so-secret crush, noted Imperial technology guru Darth Acina. Adopted by prominent Imperial socialites who named him after his faded-gray skin, Ashy was often shown off as though he were a house pet. In his formative years, however, the Rattataki did not get the joke and took his adopted parents’ grooming very seriously, believing in their desire to have him one day become an Imperial officer. An early attempt to join the military academy on Dromund Kaas forced Ashy to finally see the painful truth. Humiliated, he defected to the Republic, where he has excelled as a weapons specialist. Ashy takes great pleasure in exacting sweet revenge on the Empire one operation at a time, always making sure to send holorecordings to his disowned family that depict his every triumph as a proud soldier and citizen of the Galactic Republic. The defensive strategy rendered by B-3G9 in the First Battle of Bothawui is often cited as a primary reason for the Republic’s victory in that grand conflict. Sent to its factory of origin for upgrades and maintenance as thanks for its service, Threegee was somehow caught in an administrative mix-up. By the time the Czerka factory discovered its mistake, the combat analysis droid had already undergone partial circuit remapping to conform to protocol-droid conventions. As a result, Threegee has become a war strategist with a polite and self-effacing manner. While Threegee can no longer reach its former heights of tactical faculty, the droid is still quite deft with shield-to-power conversion calculations and starship defense management–though it does tend to fixate more over its faded glory than any recent accomplishments. Even as a young child, Kendra Novar had a particular affinity for complex calculations. She successfully sliced her first computer system at age seven, and by the time she reached adulthood she had amassed a fortune in ill-gotten credits–assets that were lost to her when she was finally captured and jailed. Recognizing her potential, the Republic offered Kendra the chance to put her skills to use for the navy, which is where the young savant truly started to shine. Exuberant, innovative and sentimental, Kendra popularized the naming of a particular evasive ship maneuver–the "Koiogran Turn"–after her home system of Koiogra. She sometimes feels the tug of her old life, but it’s never enough for her to foolishly scrap this second chance. From the very first time the Ithorian witnessed the arrival of a ship on his homeworld, Oro Wogawa has been utterly fascinated with spaceflight technology. As Wogawa sees it, mechanical systems are no different from living systems, requiring an equal amount of attention and nourishment. After stowing away on a pirate craft, Wogawa taught himself to provide such care to ships’ engines and began a career as a hired hand on any ship that would have him on its crew. Though Oro has learned to adopt a certain level of coarseness necessary to cope with crew dynamics, he is at heart a caring being. This is why, after witnessing the cruel, controlling nature of the Sith Empire all across the galaxy, Oro has opted to dedicate his affinity for the inner workings of starships to anyone who opposes them. 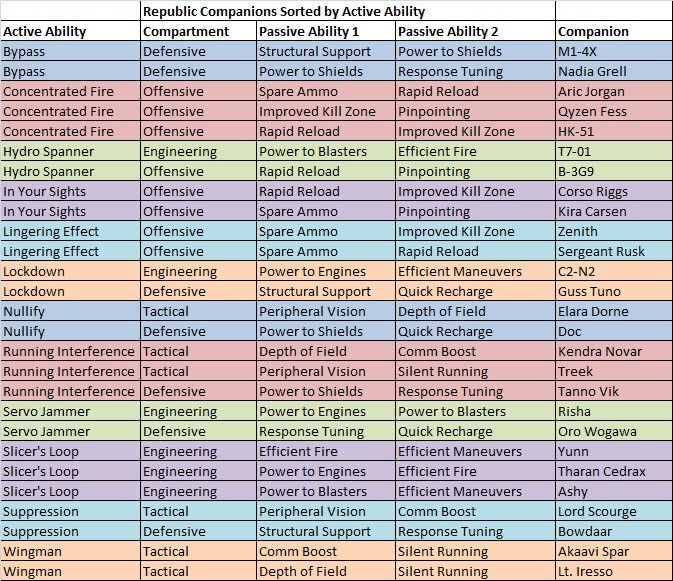 Since Galactic Starfighter uses the four new companions on each faction by default, here are all the default passive bonuses they provide. Note that the Empire and Republic bonuses are mostly the same except for bonuses 3 and bonus 7 (left is Empire bonus, right is Republic bonus). The reason for this is that two of the companions are not identical mirrors of each other in their passive abilities and causes this discrepancy. The default selection for companions isn’t ideal for every situation. If you want to handpick your own crew, here is how I would do it. 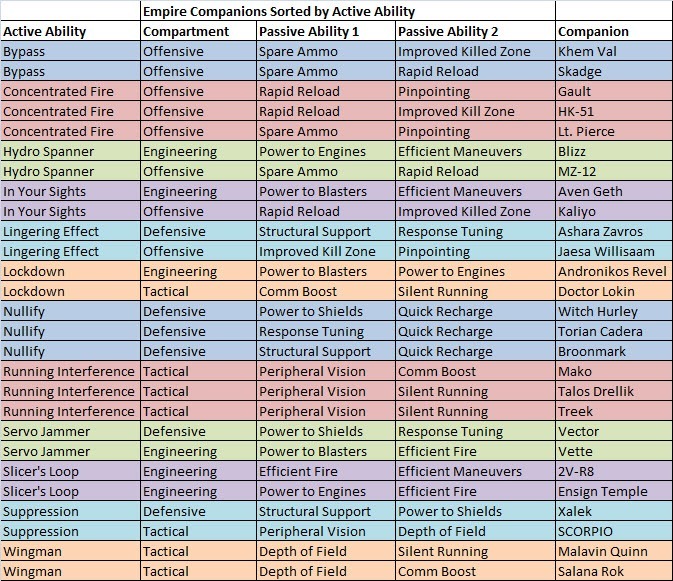 Figure out what you want for your active ability and see what companions has that active (use companions sorted by active ability chart). I personally like actives such as Bypass, Concentrated Fire, Hydro Spanner, and Nullify since it is very clear what they do. This narrows down your co-pilot and one of the crew compartments. Then for the rest 3 spots pick what 2 passives you like for each of the remaining compartments and use companions sorted by compartments chart to see which companions fit the bill. If the companion you picked is locked, then you need to pick a companion that isn’t locked and grind up 1500 fleet requisition to unlock that companion. Concentrated Fire Attacks have a 36% chance to do critical damage for the next 6 seconds. In Your Sights Zeroes you in on your target, reducing their evasion by 20% for 20 seconds. Zeroes you in on your target, reducing their evasion by 20% for 20 seconds. Attacks have a 36% increased chance to do critical damage for the next 6 seconds. Attacks have a 36% chance to do critical damage for the next 6 seconds. Sensor focus range increased by 2500m. Enemy target’s maneuvering decreased by 20% for 20 seconds. Firing arc increased by 2 degrees. Wow. BW actually spent some serious time on this. Looking forward to it more than ever now. Well this seems waaay more complex that I expected it to be. I know. I was thinking the same thing. If its too complex, people may just say screw it and not play. On the other hand, I also wonder what impact this will have on the rest of the game. Will there now be 40 min wait ques for people wanting to do regular wz’s or arena’s cause everyone is now in space pew pewing? Trying to get a group together to do Flashpoints or Operations be impossible cause no one is on the Fleet? It does get pretty funny when you are trying to sneak around a large asteroid and bump into something and your companion makes jokes about blowing up again…. Thanks Dulfy! I believe (and you mentioned) that they can be unlocked via Fleet Req, but I’d love to have a legacy toon influence all your other ships. I mean, isn’t that the whole point of Legacy? That all your characters are known to each other and share things? I dont get it…. For unlocking companion, need to get max affection on each char? Really? That’s not how I understood it, and even if its true, haven’t you had max affection for like over a year now anyways? I don’t even know what that is supposed to mean, because getting affection is part of the game. Yo Dulfy! The five new companions, can they be used outside of the new spaceships? Like, pulling them out for standard ground combat aswell? You list Nadia as a defensive companion but all of her Passives are tactical. Is this a mistake or can I forgo defensive to double up on tactical? Of course, it is all in beta. Thanks for the verification. I don’t understand about the “communication range”. What does this do? Does GSF have voice chat and you are blended out when too far from each other? Thanks! Makes a lot of sense now: Sensor range is your own detection range, communication relays that to anybody who is within communication range. Dulfy, I have a question. I’m going to start a new level 1 toon for GSF. I have HK-51 unlocked on another character of the same faction. I want to use Hk-51 on my new level 1 toon as a GSF companion. Can I unlock HK-51 on the new toon for GSF using 1500 Fleet Req, or do I have to unlock HK-51 as a companion for my level 1 toon using Credits/Cartel Coins? Please let me know. Thanks. Thank you Dulfy. You rock! It’s funny how Qyzen, who only hunts with a sword and has just one good eye, is the only Republic option for offense with the two aiming based passives; larger kill zone and higher accuracy. Meanwhile, M1-4X, a cutting edge combat droid, is stuck on defense with hull damage reduction and the shield power pool increase. At least the shield one is somewhat appropriate, but he deserves to be on offense and to be the Republic companion that gets the awesome double targeting bonuses. Qyzen belongs on defense with response tuning (evasion buff) and power to shields, and the running interference active ability. Yes he’s a hunter, but these buffs go with his hunting experience and style better than what he got before. Dulfy, I was about to unlock Jaesa Willsaam on my Sith Inquisitor to use for my Gunship, but she is not listed as an available companion, only Khem Val, Skadge, Gault, Kaliyo, Lt Pierce, MZ-12, and HK-51 . Do you know if this is a bug or intended? Bug, she only appears for sith warriors at the moment. Might be fixed in tonight’s patch.